Welcome to my page of Cosmic Art. Cosmos gets its origins from a Greek word (kosmos) which means order or harmonious, the opposite of chaos. Today the word is used as a synonym of the word Universe. In Mandarin Chinese the word is translated as yuzhou, which means space-time. The current scientific theory is that the cosmos began 13.75 billion years ago with the Big Bang. The current observable diameter is thought to be about 93 billion light years. Todays technology has changed our view of the cosmos but in reality we have only started to scratch the surface. For those places we can't see, there is imagination. 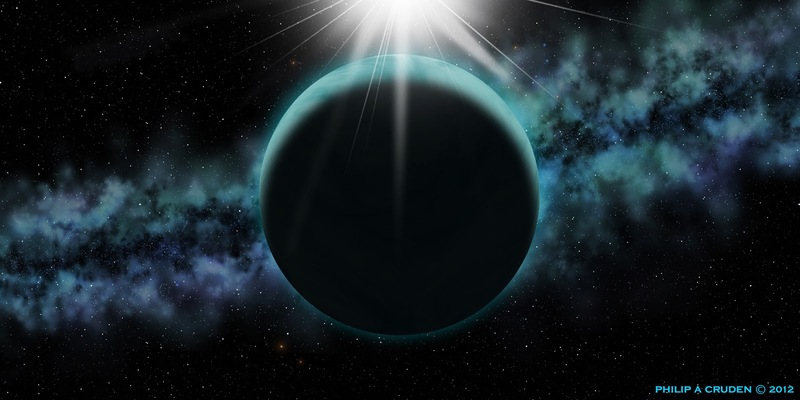 Rogue Planets are wandering planets. 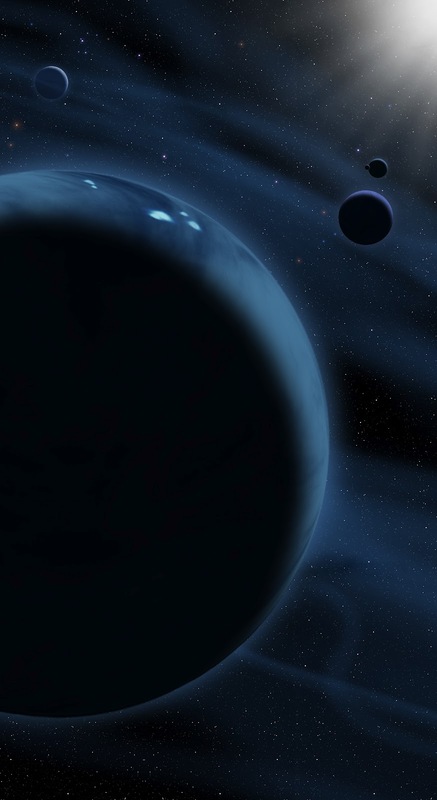 They are also known as nomad planets, orphan planets and starless planets. 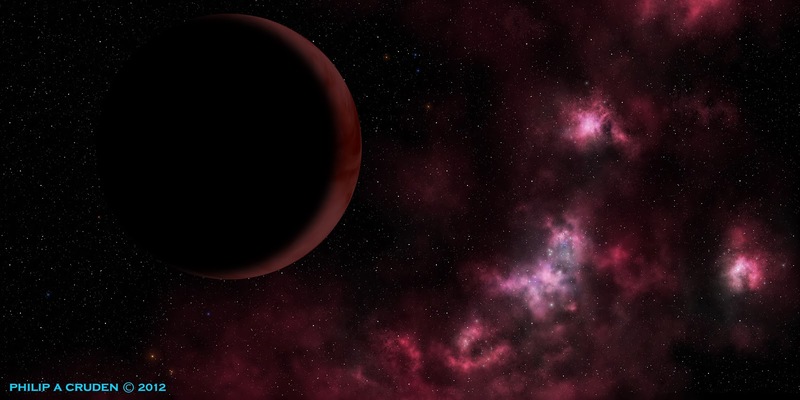 Rouge Planets orbit the galaxy directly. Astronomers have two scenarios of thought; (1) these planets were ejected from their host star or planetary system or (2) they were never gravitational bound by a star. Astronomers think there could be billions of Rouge Planets wandering our Milky Way. We really do not know what Pluto, Charon, Nix and Hydra look like. They are so far away and so small with Pluto only being 2% the size of the earth and only 2275km in diameter. Pluto is even smaller than some of the moons of Jupiter and Saturn. It will not be long before we find out what it really looks like. In 2006, New Horizons, the fastest probe we have ever sent into space traveling at 36,000mph will reach Pluto in July of 2015. Because New Horizons is travelling so fast it will not be landing on Pluto but rather a very close flyby. I can't wait to see what it really looks like. Did you know that Pluto was named by an 11 year old schoolgirl named Venetia Burney who was studying mythology at Oxford University. She named it for the "God of the Underworld"
Aside from Pluto, Charon and Nix getting a re-model, two new moon discoveries have been added too. In 2011, S/2011 (134340) 1 was discovered and in 2012, S2012 (134340) 1 was discovered. Personally I think we should just call them Ernie and Bert. I think it is amazing that these two new bodies have been found, discoveries in the Cosmos is endless even in our own solar system. New Horizons left for Pluto in 2006. At the time, mission planners did not account for the two new moons so they are all taking a good look at the math. I wish the New Horizons team all the best. 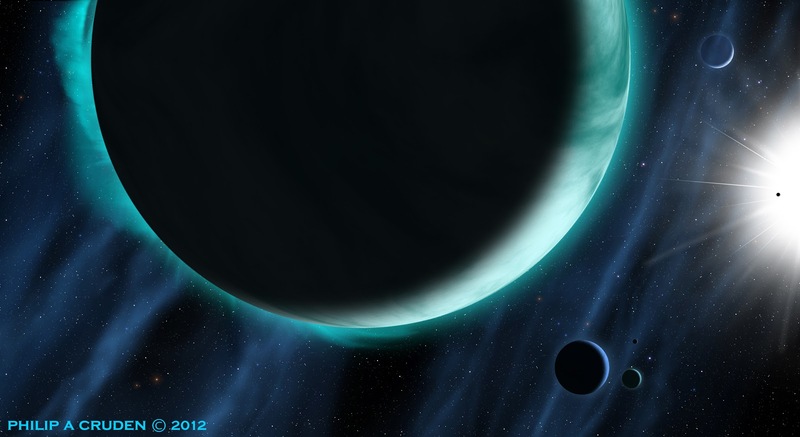 Astronomers have identified a new class of planets called Drifter Planets. 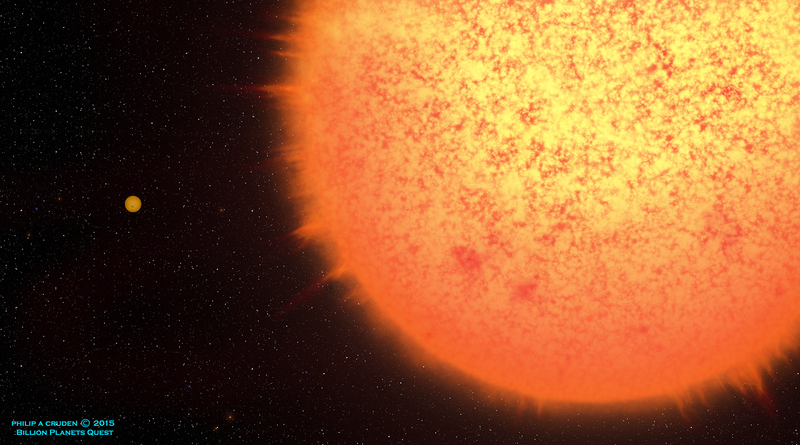 Astronomers think that space is littered with hundreds of billions of Drifters that have been ejected from their solar systems or are only distantly bound by a star. 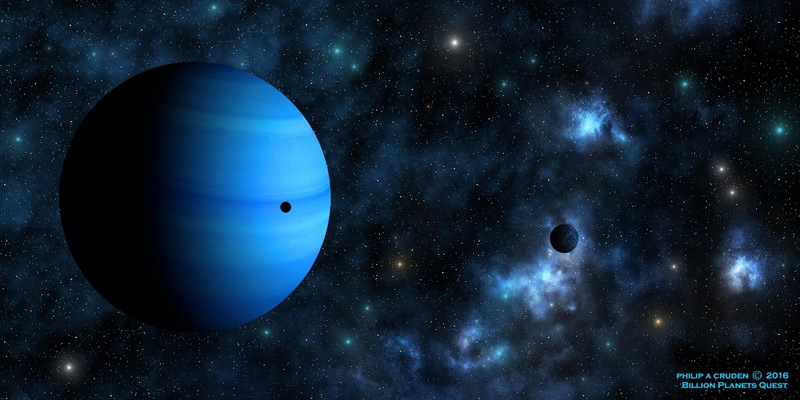 Current methods of detecting these planets only reveal Jupiter size planets. It is thought that there are two Jupiter mass planets for each of the 200 billion stars in the Milk Way Galaxy. No more than a few years ago we did not even know if other solar systems existed, now it seems as though planets outnumber the stars. This painting is a depiction of a "Drifter Planet" on its lonely journey through deep space. It is a very cold and dark journey for this planet. Sirius is the brightest star in the night sky next to our sun. With the naked eye, Sirius is perceived as a single star. In fact there are two. This is known as a binary star, Sirius "A" and Sirius "B" with "A" being the larger of the two. 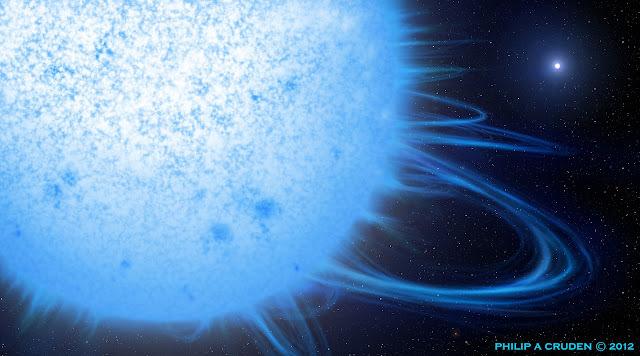 Sirius A is a white main sequence star while Sirius B is a white dwarf star. In Arabic Sirius means "The Scorcher". Sirius appears so bright to us in the sky because of its close proximity to earth at only 8.6 light years. It is about twice the size of our sun and burns at about 9,940' kelvin. Here on earth the Aurora Borealis and the Aurora Australis aka the "Northern Lights" and the "Southern Lights" are a common natural light display in the night sky. They are caused by the collisions of energetic charged particles with atoms in the high atmosphere. The charged particles originate in the magnetosphere and solar wind. They are directed by the earths magnetic field into the atmosphere. Aurorae occur on other planets also, like Jupiter and Saturn. In short the magnetic field is produced by the spinning of a planets active core. On earth the magnetic field protects us from the suns radiation. Think of it like our invisible protective shield which only becomes visible when we are hit by sun flares and solar wind. In this painting I have created a Gas Giant planet which has a large active core and a very active host star and is bathed in aurorea all the time. When I was young and I started to get somewhat of an understanding of our solar system and our place in the Milky Way, I used to think to myself, "there must be other planets and solar systems up there somewhere". In fact when people would ask me what I thought, I would say with all confidence, "There must be hundreds of them, why would space be so big, just for us?" That of course was a long time ago, long before Hubble and the recent findings of Kepler. Astronomers now believe that the number of planetary systems, just in our galaxy, is in the hundreds of billions and that does not include the Drifter Planets. This painting was conceived as my logo for my site. A lone planet sitting in front of billions of others. "The Birth of a Planet"
There was a time millions of years ago the our solar system was nothing more than a ring of dust rotating around our newly formed sun. After a star comes into being the remaining gas and dust forms into a flattened disk known as a Protoplanetary Disk. Inside the swirling rotating debris of the protoplanetary disk rocky particles begin to collide forming larger masses and gravity then starts to attract even more particles. These particles start to contract under gravity creating Planetesimals. 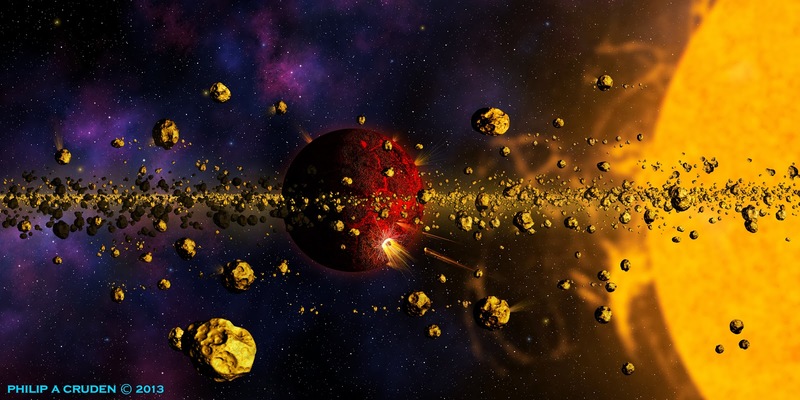 The planetesimals under gravity then start to collide with one and other forming a planet. 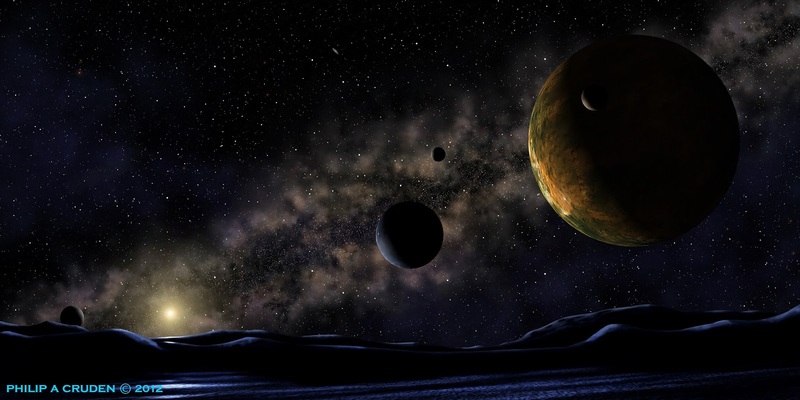 This painting is a planet in its final stages of formation with the large planet still attracting its neighboring planetesimals, In the end gravity wins. This planet is very close to its host star. This is possibly what our own planet Mercury may have looked like in its last stages of formation. Eris is the largest of the known Dwarf Planets in our solar system. It is the 9th most massive know body orbiting the sun. Eris is roughly 27% larger than Pluto and about 0.27% Earths mass. It has one known moon called Dysnomia, which is the larger one on the left. Eris is roughly 3 times the distance from the sun than Pluto. 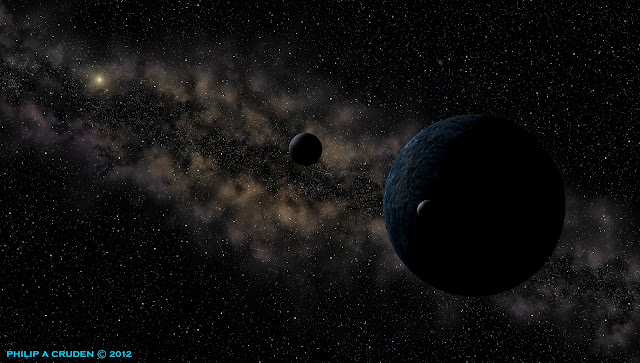 Last estimates in 2011 put Eris at around 96.5 AU or 8.97 billion miles from the sun. So, to put into perspective of how far away Eris is, if you could travel at 10 miles a second it would take roughly 25 years to get there. In this painting I have depicted Eris with two moons, I know the more they study this Dwarf Planet the more thay will find. Ceres is a Dwarf Planet located in the inner solar system. 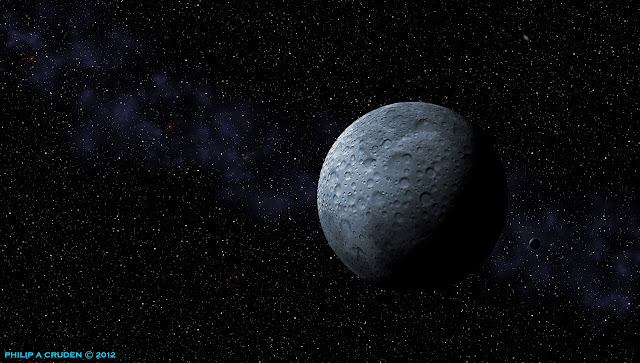 It is the only Dwarf Planet in our inner solar system and the largest known asteroid. Ceres is located in the Asteroid Belt between Mars and Jupiter's orbits. It makes up a third of the mass of the Asteroid Belt. Its composition is made primarily of rock and ice. NASA's Dawn spacecraft, launched in September of 2007 headed to Vesta, another large body asteroid, after completing a year in orbit around Vesta, the Dawn spacecraft is now on its way to Ceres. Dawn will arrive at Ceres sometime in 2015. There are no known moons orbiting Ceres, in this painting I have shown Ceres with one moon. We will know if it has a moon in 2015. This piece of art was originally conceived for my friend Tom at WI Astronomy. It is the background for his site, hence the name of the piece. WI Astronomy is a space and astronomy news public outreach site. There you will find all the latest news on space missions, up to date astronomy news, videos and much more. To check out WI Astronomy click on the link below.